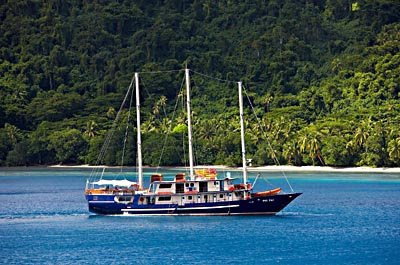 Aurora Expeditions has launched a new voyage to the remote northeast corner of Fiji aboard the luxury schooner Tui Tai. Departing from the island of Vanua Levu, this 11-day voyage will explore the deserted beaches, pristine reefs and isolated outer islands of this pacific paradise known as the Pacific Cultural Triangle. Tui Tai is the only luxury-adventure ship cruising this largely undiscovered region, which is recognised as the most culturally diverse in the country. Kioa Island is the only island in Fiji whose people are of Polynesian origin. The Kioans are masters of handicrafts and fishing, and the snorkelling and diving sites here are considered the best in Fiji. Rabi Island, inhabited by Micronesian people, is another of northern Fiji’s hidden treasures, rich in history and natural beauty. Other sites visited include the Bouma National Heritage Park on Taveuni Island, one of the country’s best conservation and ecotourism success stories; and the tiny unspoiled atolls of the Ringgold Isles. You can do as much or as little as you want on this luxury adventure. Tui Tai is equipped with mountain bikes, snorkelling gear, kayaks and scuba diving equipment, or you can simply relax and soak up the surrounds. In true expedition style, the itinerary may vary to take maximum advantage of opportunities to view wildlife or explore new territory. Guided excursions and onboard lectures by experts will interpret the natural, cultural and historical highlights of the region. Prices start from AU$6690 per person twin-share for a standard expedition cabin through to $12,990 for the ultimate two-storey Grand Stateroom. All cabins are air-conditioned and have private bathroom facilities. All meals are also included. This inaugural 11-day voyage departs on 19 October 2009, and with space for just 22 passengers, is sure to sell out quickly.